As some of our readers may remember from previous articles, there was a long-standing custom in parts of Croatia that the Roman Rite be celebrated in the Croatian recension of Old Church Slavonic, rather than in Latin. Shawn Tribe published an article about the Glagolitic Missal, as it was called, from the ancient script originally created for the Slavic languages, back in 2011. Recently, a Mass was celebrated according to this Missal for the first time in 50 years in Zagreb; we are grateful to one of the faithful who were present for providing us with this account of it. Let me start with a brief introduction. The current situation concerning the Extraordinary Form in Croatia is that there is not a single diocesan Mass available anywhere in the country. The only regular Sunday Mass was available from February 2011 to October 2014 , when the priest assigned by the Archdiocese of Zagreb suddenly died. 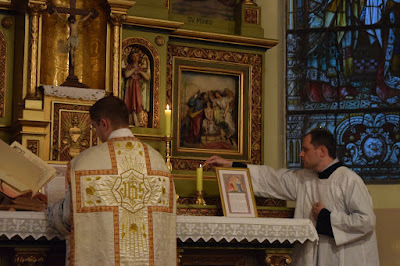 So now, we, the Coetus fidelium of Zagreb, the capitol of Croatia, have been without a priest for almost two years, so we have to rely on the generosity and availability of the visiting priests to at least have occasional Masses. Such was the recent case when a priest from the Institute of the Good Shepherd, Fr. Mateusz Markiewicz, currently stationed in Bordeaux, was on a three day long visit in Zagreb. 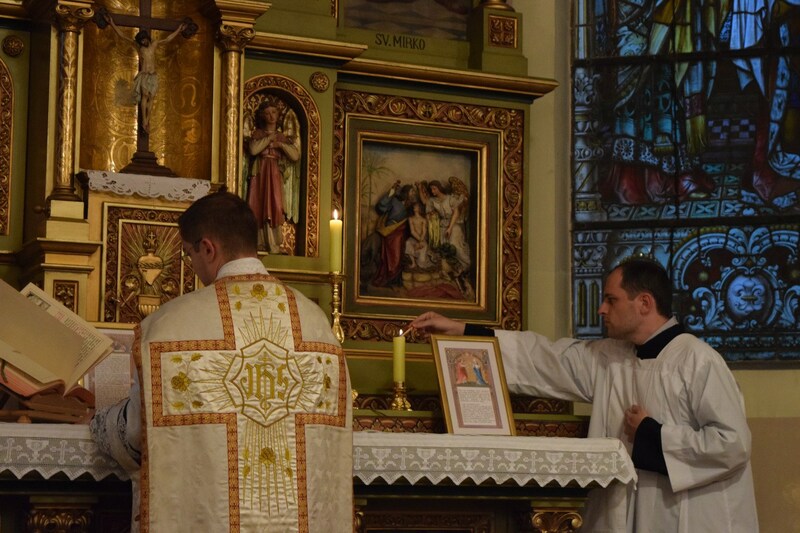 During those three days, Father Markiewicz celebrated the Traditional Mass in the church of St. Martin. 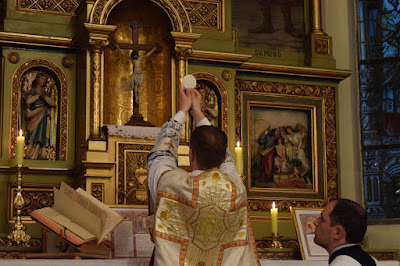 For the first two days, these were Latin Masses, but on the third day, we had a Low Glagolitic Mass, a first public Mass of its kind in Croatia after approximately 50 years. It was a votive Mass of St. Joseph, the patron of Croatia, and also of our local ordinary, Cardinal Josip Bozanić. 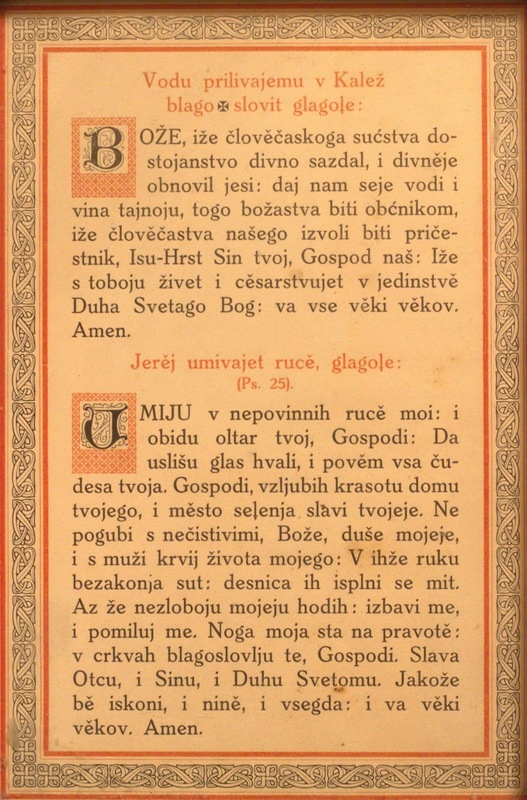 The Mass was celebrated from the so-called “Vajs Missal” (Missale Romanum Slavonico Idiomate), the last printed Glagolitic Missal from 1927, written in the Croatian recension of Church Slavonic. This Missal was transliterated to Latin script, unlike the previous Glagolitic missals, see other examples here: http://www.croatianhistory.net/etf/parcic_misal.html. As a side note, the first printed Croatian book was a Missale Romanum Glagolitice dating from 1483. You can find the digitized version here: http://dk.nsk.hr/stara_knjiga/NSK_SK_ID01/. 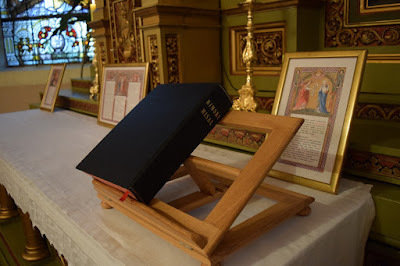 The copy of the “Vajs Missal” we used was purchased recently from the United States by the society “Benedictus”, the Croatian chapter of the Una Voce Federation. As the celebrating priest is a Slav, he had no problem in reading the Church Slavonic or Croatian. Here is a short clip of the prayers at the foot of the altar. As a gift from a local priest, we also had the Church Slavonic altar cards. A small curiosity - it was not unusual in southern parts of Croatia along the coast of Dalmatia, to have two-sided altar cards, one side containing the Latin text and the opposite side the Church Slavonic – here is an example of the Church Slavonic side from a church in Split. Unlike the southern parts of Croatia, the Glagolitic Mass was not something usual in northern Croatia, Zagreb included. However, it was regularly celebrated in the 20th century by the Zagreb Third Order Franciscans (TOR). A common name for them in Croatia was “Popi glagoljaši”, or Glagolitic friars/fathers). The Blessed Cardinal Aloysius Stepinac celebrated a Glagolitic Mass in 1942, during the opening of a new TOR parish in Zagreb. There are plans for celebrating a sung Mass with the Glagolitic chant in Croatia for the next year, so we will keep you informed. We sincerely hope that this Mass in Zagreb will serve as an encouragement for priests in Croatia, especially the younger ones, to learn the old rite, and to embrace the ancient Glagolitic legacy passed to us from the “Apostles of Slavs”, the saintly brothers Cyril and Methodius. A fun fact to end with – one of the oldest monuments of the Croatian language is the “Baška tablet,” dating from around 1100, who has an inscription in the Croatian recension of the Church Slavonic language. The tablet itself is part of a pluteum, or a partition that separated the sanctuary from the nave, so this remains one of the few communion rails that actually survived the numerous “renovations” following the Second Vatican Council.